Hyacinth macaws, Anodorhynchus hyacinthinus, are the largest of the large macaws. Their brilliant cobalt blue feathers and massive beaks are unique in the parrot kingdom. They have intensely dark eyes and black beaks with vivid orange skin around their eyes and lower mandible. 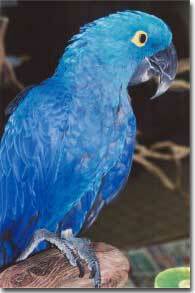 Hyacinth macaws have a length of approximately 40" and a wingspan of 46-50". They originate in the Pantanal region of Brazil, south of the Amazon. Hyacinth macaws weigh between 1200 and 1600 grams. While they have an imposing beak, Hyacinth macaws are called the gentle giant for good reason. They are affectionate and lovable. I have found them to be extremely intelligent birds that are reasonable to deal with. They are empathetic to your moods. When I was sad, my Hyacinth, Moti, was all excited and wanted to play. He looked at me carefully and crawled up on my chest, laid his head down, spread his wings, puffed up his feathers and gronked like a baby Hyacinth macaw! Hyacinth macaws can even be quite friendly to strangers if they are introduced in neutral territory. They love to play and require toys that are larger and stronger than most other birds because of the strength of their beaks. They can generate 1200 pounds of pressure per square inch and can crack a macadamia nut with ease. Hyacinth macaws love attention and they are intelligent, so tricks are quickly and easily learned. Hyacinth macaws have special dietary requirements. They need more fat and carbohydrates and less protein in their diet than the other macaws. You may need to add brazil nuts, macadamia nuts, coconuts, and walnuts to your shopping list to supplement the widely varied diet that other macaws receive. These nuts are all considered a great delicacy by the gentle blue giants. Hyacinth macaws also relish palm fruit, as it is one of their natural foods in the wild. Because of their large size and enormously strong beaks, Hyacinth macaws require a large strong cage. Because of the initial cost, space, special diet and large ongoing investment in toys required, special consideration should be taken before making the decision to purchase a Hyacinth.